My microwave turns on but will not heat. I switched power setting to 90% and it warmed up some water but it i had to run it for four minutes. I took out the filters and they look good. I removed the unit from above the range. I am going to run it to see if the exhaust flue opens. I wont have time today but i will get to it tomorrow. The unit is two years old. I would like to avoid buying a new one and extended coverage is almost as much as a new unit. Any help would be appreciated. Thank you. Rey. Hi Rey Thank you for your question. There are a couple of parts you could check. I would suggest checking your door micro switches, your fuse, and your diode. I hope that helps. You should be able to test all three of those parts with a multi meter to see if they are working correctly. Good luck with your repair. How do i get to this filter do i have to pull the whole microwave to get to the grill to remove it? Hi Richard, Thank you for your question. Before you begin any repair please unplug the appliance from the electrical outlet. Use a Phillips head screw driver to unthread the screws securing the grill. With the screws removed, open the microwave oven door then the slide the grill to the left and lift it up to remove. This will allow you to access the filter so you can either replace it or clean it. When you are done, insert the tabs of the grill into the frame and slide it to the right. Shut the oven door and then secure the grill with the screws. Restore power to the microwave. I hope this helps. Thank you and have a great day! 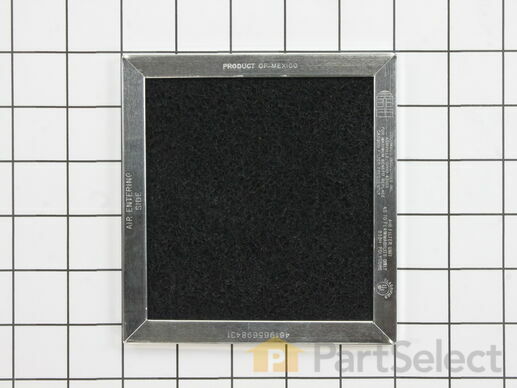 How many charcoal filters does it take and do you have a pic to show this, not the parts pic's but how to install. Mine only has one, but one person stated it has 2. Hi Frances, That is a good question. If your microwave only has one charcoal filter then just order one. I hope this helps. Thank you and have a great day. When cooking it stinks up the house. When i checked the charcoal filter it only has one but there are two blowers so the one one the right is unfiltered and there is no way to install another filter. Hi Jimmy, Thank you for your inquiry. That is correct there is only one filter listed with your microwave. To verify if you can install another filter you will need to contact Whirlpool. Their telephone number is 1-800-626-2005. I hope this helps. Thank you and have a great day! When we place something inside to reheat and push the start button it wont turn on. The message "open and close door" displays. After many attempts it would turn on but after a couple weeks it got worse, but now it only beeps and the display is filled with lights. The unit was unplugged to stop the beeping. Hello Chuck thank you for your question. I would recommend replacing the door switches for your unit. There are three of them that should be replaced at the same time. Door Switch - 3 Terminal PartSelect Number: PS10057151, Door Switch PartSelect Number: PS2361111 and Door Switch PartSelect Number: PS2361113. If even one of these switches is not functioning properly the unit is not recognizing that the door is shut to allow the unit to run. I hope this helps! Unit quit running, a few days later the clock also quit. Is there a fuse i can replace? Hi Alvin, Thank you for your question. Yes there is. I have listed that part in a link down below for you. Good luck with your repair. How many charcoal filters does this model have? Hello Gail, Thank you for the question. The model has 1 Charcoal Filter. Thank you for your inquiry, good luck with this repair! Hello Jim, Thank you for contacting us. I have researched the model you have provided and have found the part you are looking for is PartSelect Number PS11769323. Thank you for your inquiry, good luck with this repair! It was installed and came soon. Bought a 2 year-old house, where nothing had been done. The hardest part was cleaning the grease that was holding the old clogged filter. New one was easy to install for this octogenarian lady, shipment was speedy. Replacement works as well as can be expected for a ductless exhaust. Part came as promised and fit perfectly. Exactly what I needed and very easy to install. Easy ordering and arrived quickly.